The Weather Observer’s Handbook provides a comprehensive, practical and independent guide to all aspects of making weather observations. Automatic weather stations today form the mainstay of both amateur and professional weather observing networks around the world and yet – prior to this book – there existed no independent guide to their selection and use. Traditional and modern weather instruments are covered, including how best to choose and to site a weather station, how to get the best out of your equipment, how to store and analyse your records and how to share your observations with other people and across the Internet. From amateur observers looking for help in choosing their first weather instruments on a tight budget to professional observers looking for a comprehensive and up-to-date guide covering World Meteorological Organization recommendations on observing methods and practices, all will welcome this handbook. Sophisticated equipment for weather observing is now within reach of more people than ever. Yet a poorly sited station or a wrongly interpreted report can do more harm than good. With this marvellous book, Stephen Burt has given us a very practical and helpful guide to installing and using one’s own reporting station, enhanced with perspective drawn from the centuries-long history of meteorological instrumentation. 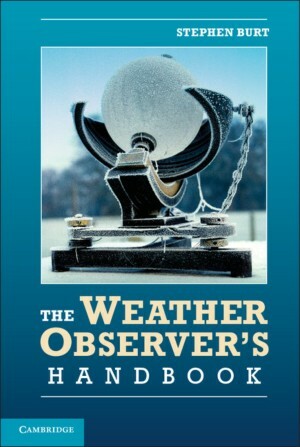 The Weather Observer’s Handbook is an ideal companion to the practice of monitoring the atmosphere. We have many amateur members and schools in our Society and I’m often asked if I can recommend a good book to help them in their observing exploits: well now I can … If you have an interest in observing the weather then this book is as essential as your observing equipment. I like this book very much. I am a lifelong weather observer and user of weather data both as an amateur and a career professional – spanning the years from manual-only to globally-networked automated observing systems. This book answers so many of the questions I have had over the decades and the many questions I continue to field – from fresh beginners, to experienced amateurs and on to a wide range of professionals. At last I have a single book that I can point people to. It is comprehensive and scientifically rigorous – yet very readable. Thank you, Stephen – well done. Metadata – what is it, and why is it important? Copyright © 2019 - All Rights Reserved - Prodata Associates Ltd.